Aloha! Authenticity, intention, connection- these are the true roots of Leahlani Skincare.. Leahlani Skincare is a mix of vibrant botanicals, skin softening clays, delicious tropical fruits and Hawaiian nectars blended in intimate batches in our private studio on the North Shore of Kauai. Each product in the Leahlani line captures its beautiful color from mother natures palate. Aloha Ambrosia Morning Moisture Elixir – This light-weight morning elixir, filled with Vitamin A & C and antioxidants, is carefully formulated to hydrate and nourish your skin, providing each cell with the essential nutrients it needs throughout the day to leave your skin well fed, perfectly moisturized and wholly nourished. Think of it like a green drink for your skin. Meli Glow Mask – Made up of enzyme and vitamin rich wildcrafted fruits, nutrient dense beauty oils, skin moisturizing hyaluronic acid and stimulating clays steeped in the creamy fusion of organic Hawaiian raw honey, Meli works at the molecular level to increase blood circulation and oxygenation, producing a beautiful and healthy ‘rosy glow’. 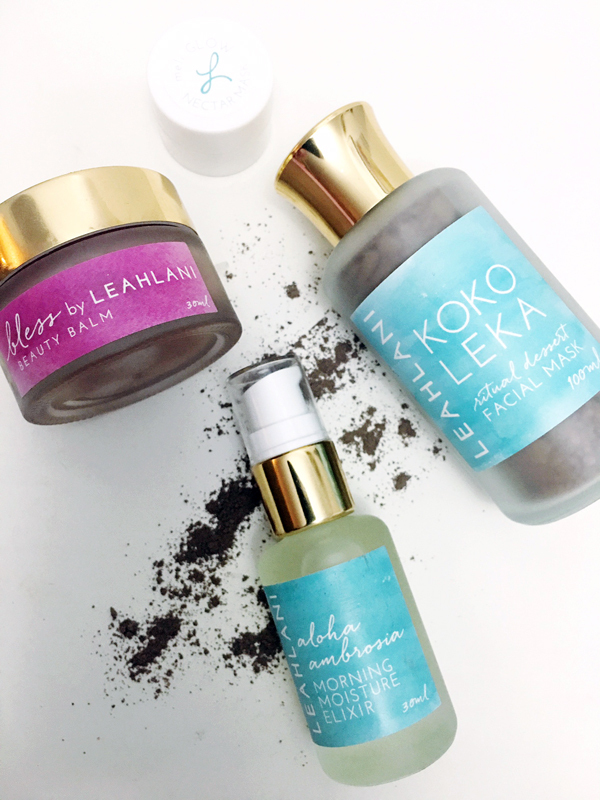 Kokoleka ‘Ritual Dessert’ Facial Mask – Kokoleka is an advanced formula that contains Molokai black sea salt with activated coconut charcoal, which will help to draw out impurities and detoxify the skin while replenishing it with the remineralization properties from Bohemian black fango clay. Rich in fulvic acid, the mask helps to rejuvenate the body’s cellular tissue, slowing down the aging process while organic cacao and acai fruit fortify the skin against free radical damage. Bless Beauty Balm – Whether you use it to remove makeup or massage into skin after serum, r ich, organic shea and cocoa butters coalesce together with cold pressed beauty oils to nurture and bless your skin and lips. This concentrated beauty balm is free of water, wax and emulsifiers ensuring that every last dollop is full to the brim with 100% potent and pure skin softening and skin loving ingredients.